Two community clean ups have been planned, one for Aptos Creek and one for Hidden Beach. The Aptos Creek Cleanup is set for Saturday, June 14 and another set for Saturday, July 5th at Hidden Beach. Both cleanups are being done in conjunction with Save Our Shores. 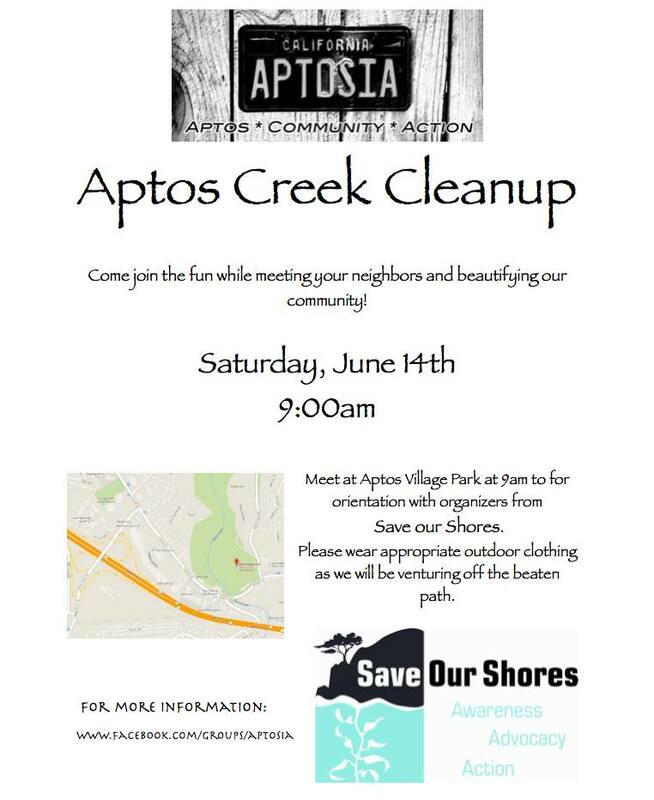 The Aptos Creek Cleanup on June 14th will be meeting at Aptos Village Park at 9 AM. Be sure to wear long pants and closed-toe shoes. There’s a write-up on this site about a previous Aptos Creek cleanup to get an idea of what the experience is like. The Hidden Beach cleanup is being organized by the Rio Del Mar Improvement Association. The group will be meeting at Hidden Beach Park at 8 AM before heading down to the beach. This is a particularly important time to clean up the beach as the July 4th festivities usually leave the beach looking quite a bit worse for the wear.